Royal Thai Crab Cakes are made with fresh lump crabmeat, fluffy cooked rice and bits of salty ham. These light, crisp crab croquettes paired with sweet and sour dipping sauce are a fantastic appetizer, fit for royalty. I decided to take Advil and sit and read cookbooks until the pain subsided. I picked up True Thai by Victor Sodsook which I’ve had in my cookbook collection for years but never gave my full attention. So many great looking recipes jumped out at me but the Royal Thai crab cakes were the most compelling. I love that this dish was developed for royalty and that the crabmeat is bound with cooked rice instead of bread crumbs. 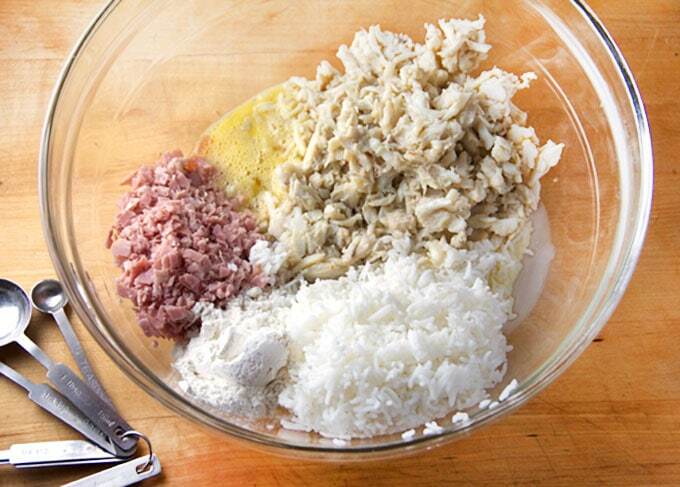 Put all of the ingredients into a large bowl: lump crabmeat, cooked rice, chopped ham, eggs, flour, condensed milk and salt. The combination of fresh lump crabmeat and fluffy cooked rice makes for a delicate texture and brings out the sweetness of the crab. Tiny bits of chopped salty ham add a delicious depth of flavor. Mix everything together and form into small, 2-inch patties. 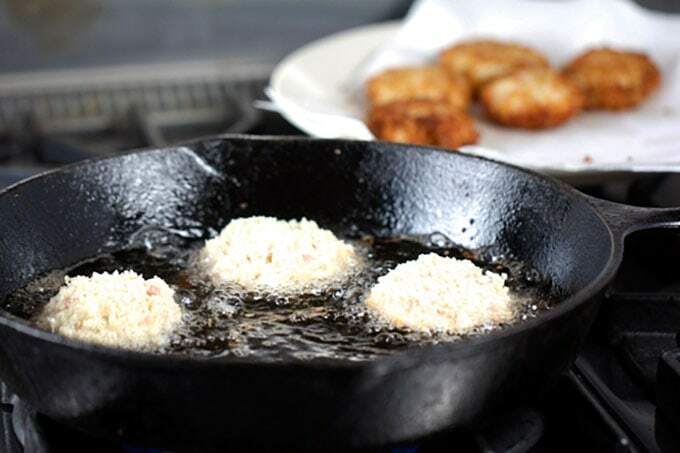 Coat the patties with Panko crumbs and sauté them until they’re golden brown. When you sauté the crab cakes, they get a beautiful golden brown crispy crust. Sweet and sour dipping sauce is the perfect accompaniment and a cinch to make. In a small saucepan, simmer a mixture of water, vinegar, sugar and salt for about 10 minutes. Remove it from the heat. When cool, mix with thinly sliced cucumbers, shallots, and chilies. 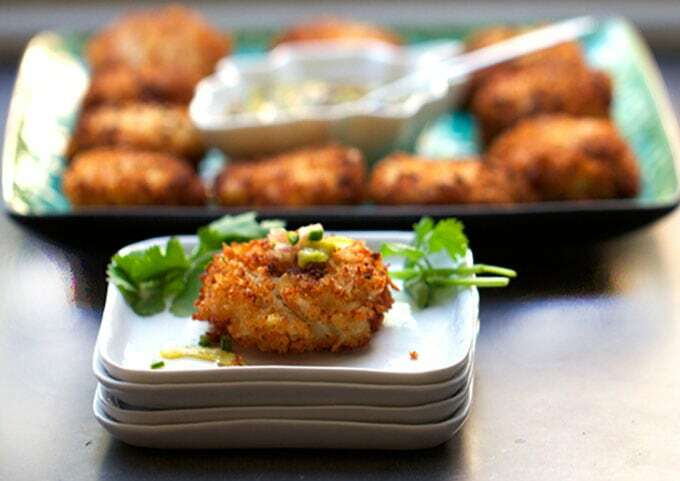 Serve Royal Thai Crab Cakes as an appetizer or as a first course for a sit down dinner. I can see why these are suitable for royalty. They have that wonderful balance of complex flavors that is so prized in Thai cuisine, and they make an elegant presentation on a platter. If you like cooking Thai food at home, you might also enjoy these Thai BBQ Ribs or this Thai Steak and Noodle Salad or this quick and easy recipe for Thai Green Curry Chicken. And be sure to check out Panning The Globe‘s ever-growing collection of Thai Recipes. Here’s the recipe for Royal Thai Crab Cakes. If you try this recipe I hope you’ll come back to leave a comment. I’d love to know what you think! Make the sauce In a small saucepan, combine water, vinegar, sugar and salt. bring to a boil. Reduce heat to a gentle simmer and cook, stirring occasionally for 10-12 minutes, until it thickens slightly. Remove from heat and set it aside to cool. Meanwhile put the sliced cucumber, sliced shallot, and chilies into a small serving bowl. Pour the cooled sauce on top. Stir and set aside. 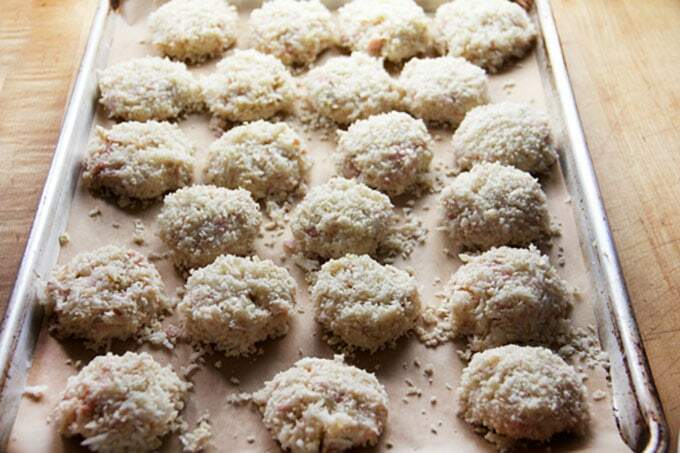 Make the crab cakes Sprinkle Panko bread crumbs onto a large plate. Line a baking sheet with parchment paper. In a large bowl, add the crab, ham, eggs, flour, condensed milk, rice and salt. Use your hands to mix thoroughly. Form the crab mixture into small patties (about 2 inches across – about 3 level tablespoons of the mixture per cake) You’ll have to press them together firmly as you shape them, to get them to be sturdy. As you form a cake, press it into the plate of crumbs. Coat both sides and place it onto the parchment. Continue until all the crab is used. You should have 20-24 crab cakes. Line a large plate or cookie sheet with paper towels. Heat about 1/2 inch of oil in a large heavy skillet over medium heat, until it’s hot enough to sizzle a Panko crumb. 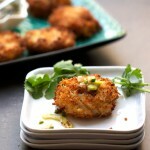 Cook crab cakes in batches of 4 or 5 until golden brown and cooked through, about 25-35 seconds per side. Using a slotted spoon or slotted spatula, transfer cakes to paper-towel-lined plate or cookie sheet to drain. 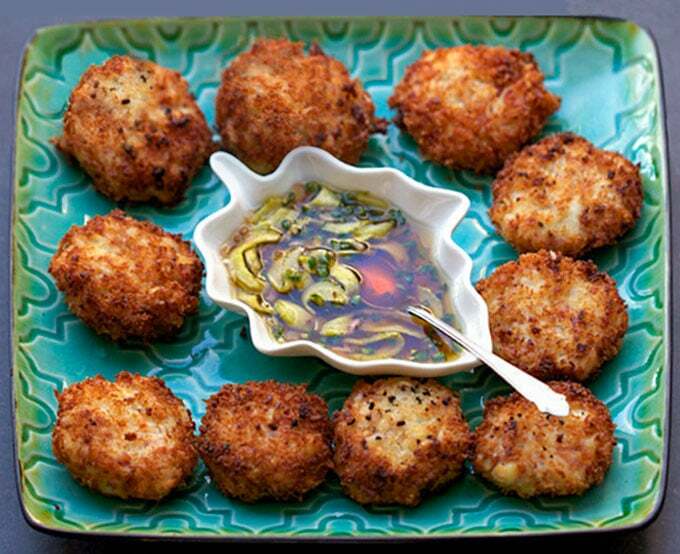 Arrange crab cakes on a platter and serve hot with dipping sauce. Note: crab mixture can be made a day ahead and kept covered in the fridge. I adore crab cakes and the sauce for these sounds so good! These are going on my must try list! Thanks Michelle! When you try them I hope you’ll come back and let me know how you like them! Dear Lisa, what a fabulous presentation of these Thai crab cakes! Crab cakes are really popular in RI where I grew up, but I’m certain I never tried any quite like these with the rice and ham. The golden crust is amazing! Thanks Allie! These really are tasty and special – after all they were designed for royalty! can you freeze these crab cakes to fry at a later time. also the sauce? I would suggest frying the crab cakes and then freezing them. You can reheat them in a 425º oven on a baking sheet. Brush the sheet with a little oil first. It will probably take 15-25 minutes for them to heat through. The sauce can be made a day ahead but you might want to slice up the vegetables and keep them in a baggie and add them to the sauce closer to the time you’ll be serving, so they stay crisp. these look amazing was a little bummed that there is flour and bread crumbs in them my son is allergic to wheat. wounder if we could figure out a way to make it without that hummm any ideas ? Hi Melinda, how about rice or almond flour for the mixture and gluton-free bread crumbs to coat them? Or if you can’t find gluten free bread crumbs, I bet you can get away coating the crab cakes with rice flour before you sauté them. You might also try mixing them with a little cooked quinoa and mashed potato and skipping the flour altogether. If they hold together well, try searing them carefully, without any coating at all. If you decide to try any of these ideas, I’d love to know how they turn out! These crab cakes look amazing! I love the Thai twist!